Don’t trust any other auto body shop for collision repair. 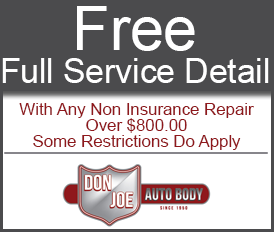 Don Joe Auto Body provides exceptional auto body service, detailing and repair for all types of issues, from minor scrapes to windshield replacements. We can handle direct insurance claims for GEICO™ and other major insurance companies. The professionals at Don Joe Auto Body understand that getting into an accident is never convenient. However, at our auto body shop in Great Neck, New York, we do everything in our power to make your experience as hassle-free as possible. Turn to us for all of your auto body repair and service needs. You can count on us to deliver! We are fluent in English, Spanish, and Italian. Contact us in Great Neck, New York, to request a collision repair for your vehicle so we can restore it to its original, excellent condition.